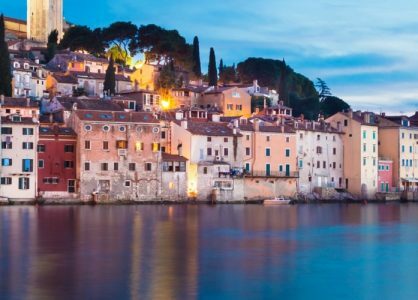 An opportunity to get away from it all in Croatia is not to be missed. A visit to the stunning Istrian countryside is the perfect retreat. 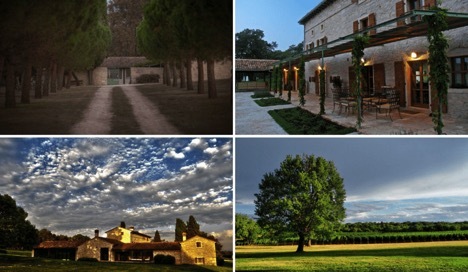 Villa Meneghetti is a stancija (or homestead) that is located between Bale and Barbariga. To get there, weave along an unpaved, dirt road, before the stunning property reveals itself. You’ll discover a boutique wine hotel that is part of the renowned Relais & Châteaux hotel brand. 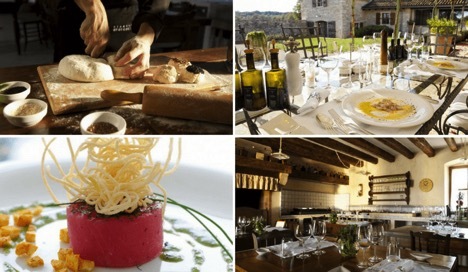 It boasts a fine-dining restaurant, a wine cellar and wine-tasting room, on-site vineyards and olive groves. The entire Villa Meneghetti estate is spread over 30 acres. Due to its private location, Villa Meneghetti offers the perfect escape for foodies, wine connoisseurs, and anyone who simply wants to relax in gorgeous surroundings. Villa Meneghetti’s boutique wine hotel has only four elegant guest rooms. The deluxe guest rooms are situated in an old farmhouse that features exposed stone walls and wooden beams. Three rooms are located on the first and second floors of the main building, while the fourth deluxe room is in the small, detached house on the grounds. For utmost comfort, all Villa Meneghetti’s guest rooms feature a king size bed, a flat screen TV, a wine cooler, and a wood burning fireplace. On-site there is indoor and outdoor swimming pools, and a shared lounge room. Prices start at 106€ per night based on two guests in a standard room. Breakfast is included. Just a two-hour ferry ride from Split, Hvar is a popular destination for the rich and famous. Lunch at Villa Meneghetti is an experience that is not to be rushed. It’s not unusual to find that lunch slots are booked for at least hours. The restaurant has indoor and outdoor tables. Reservation is recommended to avoid disappointment. The menu at Villa Meneghetti changes seasonally. Every delicious meal is paired with wines from the Villa Meneghetti winery. The gnocchi with wild black trumpet and chanterelle mushrooms, prosciutto and beefsteak tomato is a popular choice. Malvazija 2013 is the perfect wine pairing. For the main course, pork tenderloin in tempura with braised shredded green cabbage and cherry tomatoes, served with a red wine reduction is a modern interpretation of a classic Istrian winter dish. Villa Meneghetti’s most popular wine, that is simply called Red, is a blend of Merlot, Cabernet Sauvignon and Cabernet Franc. For dessert try Labinski krafi. The traditional Istrian sweet ravioli is filled with cottage cheese and raisins. As Meneghetti is yet to produce its own dessert wine, Kabola’s Muskat is an excellent pairing. After lunch it’s time to explore the Meneghetti winery, located on-site. It produces five different types of wine. The winery has also teamed up with Kuća Glavić, a producer from the Konavle region, to create new types of wine for their customers. The Meneghetti wines are divided into four lines that are based on their distinctive character and flavour. The Art in the Bottle line features their signature wines: Meneghetti White (a blend of Chardonnay and Pinot Blanc) and Meneghetti Red (a blend of Merlot, Cabernet Sauvignon, and Cabernet Franc). The Soul of Istria line features Malvazija, Chardonnay, and Merlot wines. The popular Malvazija 2013 is mostly made of Malvazija Istarska grapes, and blended with small quantities of Chardonnay and Pinot Blanc. The Taste of Joy line features Meneghetti Classic, a sparkling wine made in the traditional Champagne method. 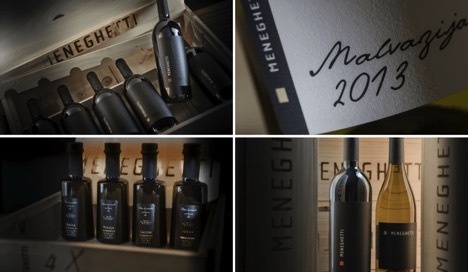 Meneghetti also produces four fabulous extra virgin olive oils: Leccino, Bjelica, Rosulja, and Buža. 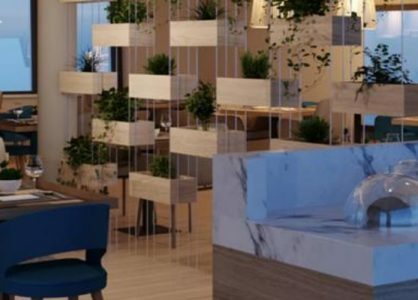 Call us today to find out more about this truly luxurious retreat. 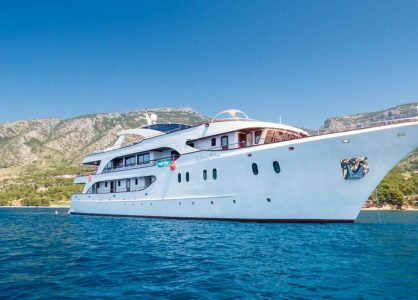 We suggest combining this with a Croatia island-hopping cruise for a holiday that encompasses the best of the country.